This region has seen so much violence in the past decades that the world is growing numb and tired of listening. It is exactly for this reason that we must actively work to make the voices of the weakest heard. Generations of children are born and raised in war zones, witnessing unspeakable violence, and living with the countless consequences of growing up amid such instability. But children of war are still children, with the same thoughts, hopes, dreams, and fears as their luckier peers—and, given a voice, they can speak truths like only children can. The Haneen exhibition at Beit Beirut, running from February 20 to March 4, is giving a rare opportunity for the smallest, most vulnerable of voices to be heard. 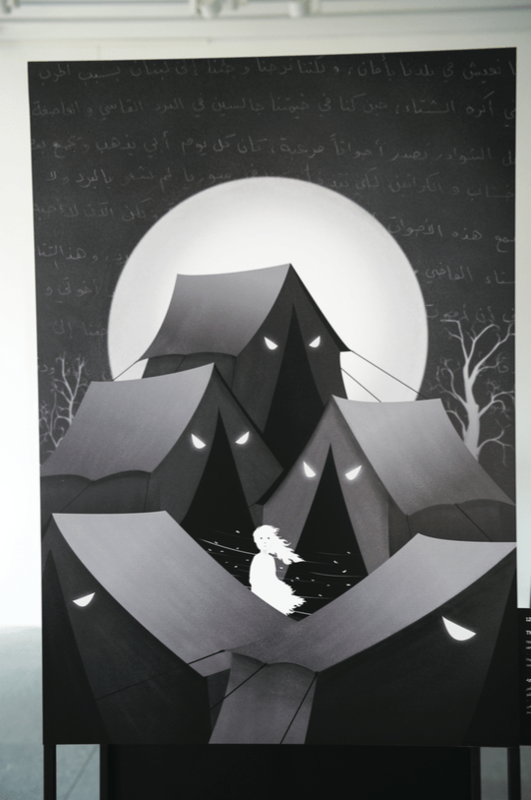 The written words of 39 Syrian refugee children living in Lebanon were turned into works of art by 47 Lebanese and Syrian artists as part of a collaboration between the United Nations Children’s Fund (UNICEF), BEYOND Association—a Lebanese NGO that promotes awareness surrounding social, economic, cultural, and other issues among different communities, especially the underprivileged—and Yelostudio, a collaborative network of designers, storytellers, and animators in Lebanon. Haneen, which means longing or yearning in Arabic, features these artworks, as well as several sculptures of children, set to a soundtrack also inspired by children’s words. The project includes a book of the full texts written by the children, as well as their biographies. UNICEF and BEYOND have established over 100 centers in Lebanon for the rehabilitation of children exposed to war. At the centers, these children, many of whom have been without an education as a result of conflict, are taught skills to improve their literacy and numeracy, and are introduced to music and other subjects. BEYOND’s press club, which convenes at several locations, taught children to express their thoughts using poetry and other kinds of writing. These became the inspiration for Haneen. When UNICEF’s Soha Bsat Boustani, the initiator, supervisor, and project consultant for Haneen, saw these pieces of writing, she refused to allow them to remain unknown. “When you are in the field, when you meet children and listen to them, you feel a moral obligation to do something with their words. We didn’t want to lose these words. 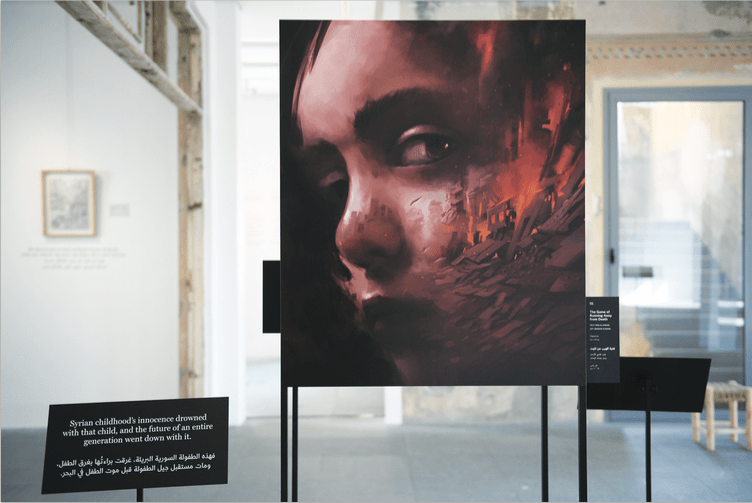 We felt there was amazing potential to get their voices heard all over the world,” says Boustani, adding that organizers intend for the exhibition to travel to other countries after its launch in Lebanon. 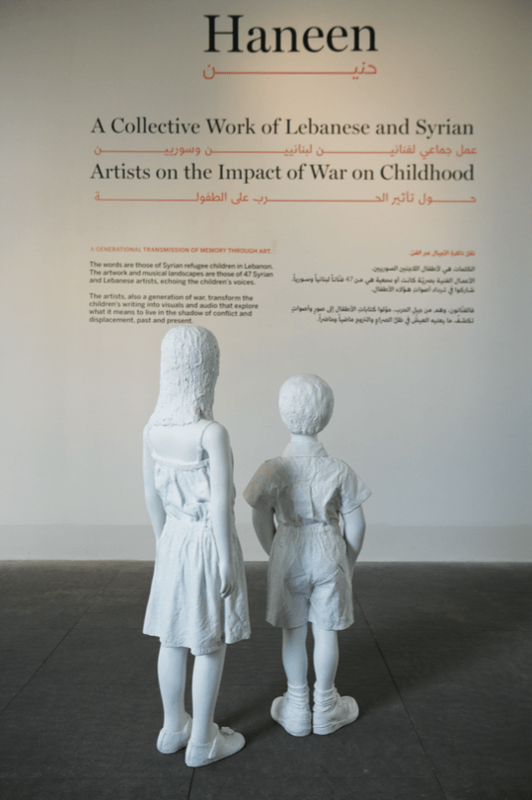 From touching murmurs of cherished memories and quiet whispers of hope to heart-wrenching cries for help and deafening calls for justice, the children’s words are displayed side by side with works of art that were inspired by the texts, many created by artists who themselves were once children of war. 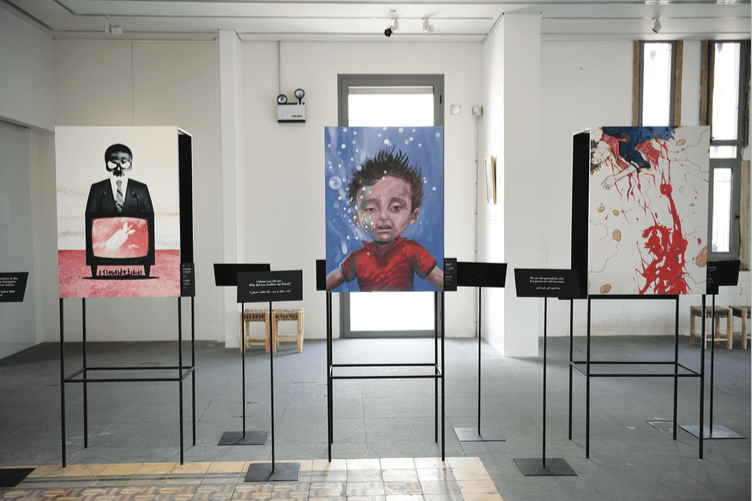 As visitors walk among the bullet-hole-ridden, partially destroyed walls of Beit Beirut—itself a glaring symbol of war—taking in these visual and penned expressions of love, faith, despair, and anger, the exhibition becomes a conversation on resilience echoed between generations and nations. One child, 14-year-old Waad al-Zouhouri, asks if her beloved doll, which she accidentally left in Syria during their escape, grew up too fast just like she did. Demonstrating remarkable wisdom, she asks the world where their empathy has gone, and is determined to get an education and become a journalist one day. 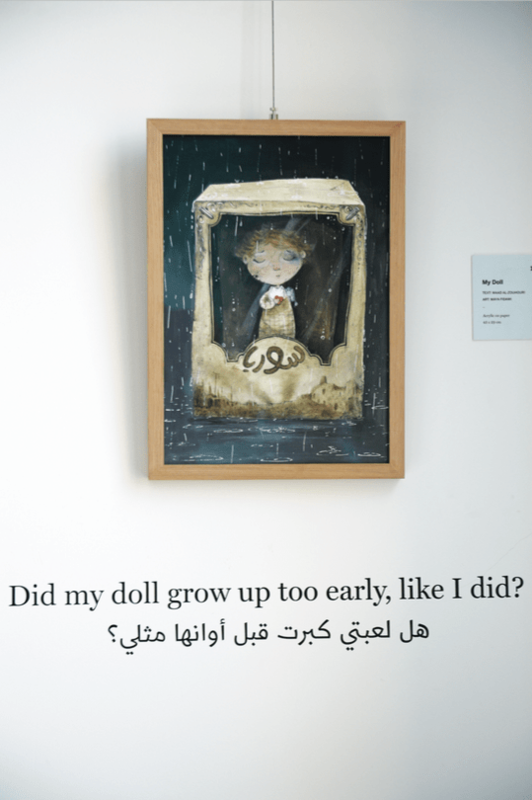 Artist Maya Fidawi interpreted the words into a faded, cartoon-like artwork of a sad-looking doll in the rain. Another child, 10-year-old Fatima al-Tamer, laments her 14-year-old friend becoming a child bride, a subject several others broached in the exhibition. Her words were turned into an intricate line drawing of a little girl holding a bound bird, her eyes covered in flowers, by Chadi Aoun, director of Yelostudio and the curator of the exhibition. Like many others featured in the project, Fatima’s dream is to be a doctor one day. Some children narrate the simplest of things. Tomato sandwiches and her mother’s kisses are what Waad al-Mohammad misses most. Since her mother’s death, she now hates tomato sandwiches, she writes in her poem, which was interpreted by Joelle Achkar into a mother holding her child, etched on a natural rock that the artist found by the sea. 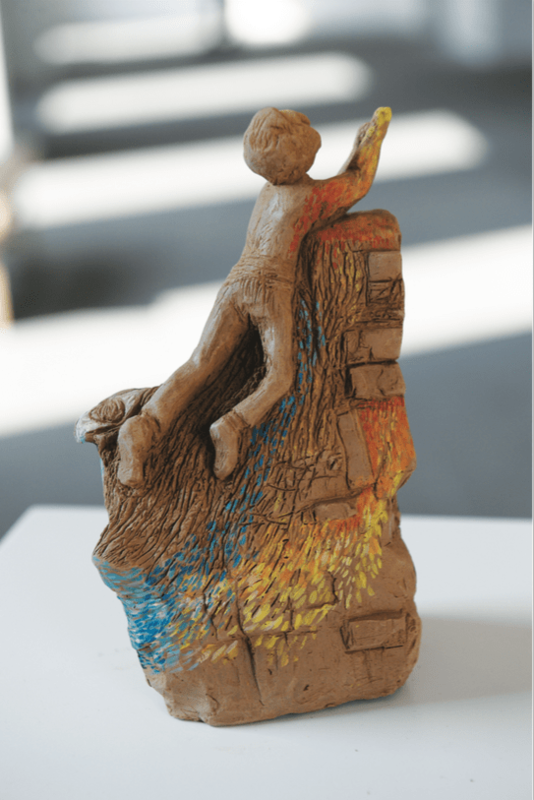 The exhibition has helped give some children more than just a metaphorical voice. Ten-year-old Ali Harba became mute as a result of trauma. He wrote a harrowing account of losing both his biological and step fathers, the latter of whom he remembers abusing his family. 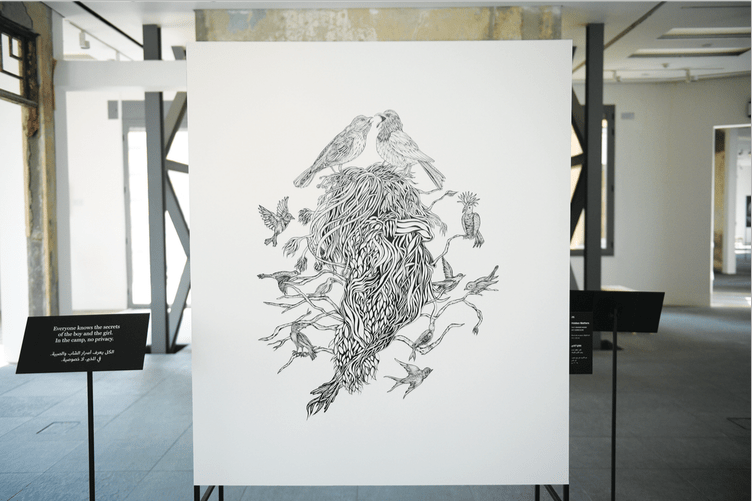 It was interpreted into a monochrome abstract drawing by artist Sandra Ghosn. Ali has since regained his ability to speak and, after taking a photography course, hopes to one day become a war correspondent. Most of the children whose works were featured in the project were present at the exhibition launch, seeing the art for the first time. While some shied away from reporters, others beamed with pride standing next to their works. Lively Waad al-Zouhouri, the young author who misses her doll, says the painting was exactly how she had visualized her poem. Tanya Chapuisat, UNICEF’s representative in Lebanon, notes another important reason behind the project. “We did this because in times like these, when tensions are running high, it is a moral obligation to unite and focus on what we have in common instead of what divides us,” she said in a press release. Ultimately, the cruelty of war impacts childhood the same way all over the world. While writing and art cannot stop violence on their own, they can be vital tools for self-expression, and coping mechanisms that can change the impact of violence. Our humanity is what unites us in the worst of times, and few things are as moving as the expressions of suffering children. However tired we are, the least we can do is lend an ear.